IS YOUR “ENERGY EFFICIENT” HOME REALLY ENERGY EFFICIENT? 1. PROPER INSULATION: Many times the required specifications for the home's insulation are not followed or poorly installed. Common areas of missing or inadequate insulation are located in the top of exterior walls and in the critical attic locations where most of the heating or cooling loss occurs. Non-intrusive thermal imaging testing (use of heat sensitive cameras) is routinely performed to locate the missing insulation. 2. 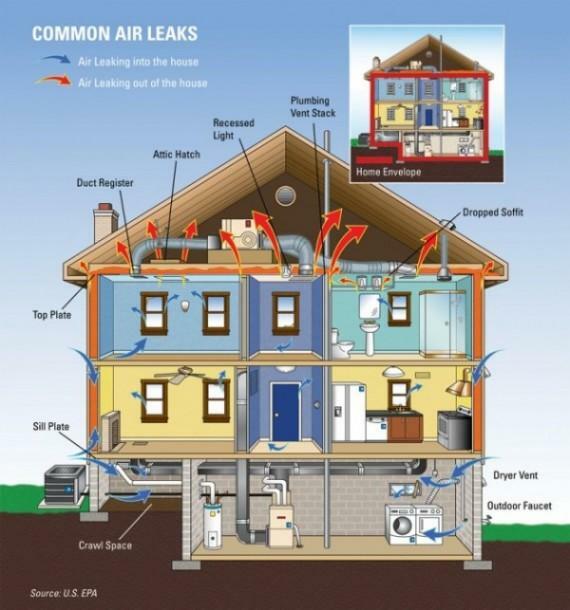 EXCESSIVE AIR LEAKAGE: An energy efficient home is required to have minimal exterior air leakage. The rational is simple. You want to keep the heated or cooled air (that you just paid for via the energy usage of your HVAC system) in your home and re-circulate it – as compared to having it escape into your roof cavity or through unsealed windows into the outside environment. If you remember your father or mother reminding you to close the door when the "heat" or "A/C" is on – it's the same principal. A "blower door test "is performed to determine the amount of air leakage within your home. 3. AIR DUCT LEAKAGE: Same rational as above except the air leakage originates from holes or loose connections in the large air ducts that are built within the walls and located in the attic of your home. These air ducts are designed to transport and deliver the heated or air conditioned air to each room of your home. An "air duct leakage test" is performed to determine the efficiency of the air duct system. 4. PROPER AIR FLOW FROM EACH REGISTER IN EVERY ROOM: The large air vents in the ceiling area of your home are called "registers". The building plans for your home specify "how much air" must flow from each register in an amount called a "CFM" which means "cubic feet per minute." It is this amount of moving air or "air flow" that actually makes you feel cool in the hot summer months. Many times the HVAC systems (heating and air conditioning systems) are not properly balanced or adequately sized to allow the proper amount of "CFM's" to be delivered to each and every room. When this condition occurs, our clients typically inform us that certain rooms, or areas of the home, are "too hot" in the summer and "too cold" in the winter. An "air vent" test is performed to measure the air flow at each register in the home. Believe it or not, we have had client homes pass energy "certification" tests where they failed to install the required air registers in the ceiling of the home. A condition we equate to as "installing 3 wheels on a 4 wheel car." 5. IMPROPER SIZING OF CONDENSERS AND BLOWER UNITS FOR THE HVAC SYSTEM: In an attempt to be "more energy" efficient or simply to save money, HVAC systems are many times undersized in capacity (i.e. 3 ton system vs. 4 ton system) and cannot adequately heat and cool the square footage of the home. This typically occurs with homes that have high ceiling areas, where the square footage of the home does not correlate with the large volume of air that needs to be heated or cooled. In some instances involving our client's home – the wrong equipment is installed. The "air vent" test described above measures the total "CFM's" for the system and is used to determine the adequacy of the HVAC system installed within the home. The good news is that the "ENERGY EFFICIENCY" of your home can be readily tested for compliance and corrected for deficiencies.